The funerals last week of eight victims from the boat that sank off Christmas Island in December brought to mind the sinking of the SIEV X. The boat went down on 19 October 2001 at 3.10pm, en route to Australia. Not one funeral could be held for the 353 asylum seekers who drowned that day. The bodies were lost at sea. No one, apart from the survivors, witnessed the tragedy. After the initial flurry of media interest, the tragedy disappeared from public consciousness. It was astonishing how quickly amnesia developed about the largest maritime disaster off Australian waters since World War II. Unlike the SIEV X sinking, the more recent tragedy was witnessed by many people. It took place close to shore, while the other took place on the open seas: out of sight, and eventually out of mind. The victims were not entirely forgotten. A week after the SIEV X sinking, Melbourne's asylum seeker community gathered in a hall in Preston, Vic., to commemorate the event. The mourners included close relatives of the deceased. The grief was palpable. I have rarely seen so many distressed people in one gathering. Their distress was compounded because, as holders of temporary protection visas, they could not visit survivors of the tragedy. The Howard Government did not organise memorial services. More telling was its treatment of survivors who were taken to Jakarta. Seven of the 45 survivors arrived in Australia months later. Those who were accepted by Finland, Sweden, Norway, New Zealand and Canada, received immediate permanent protection in recognition of their trauma. They were able to begin rebuilding their lives. In contrast, those who came to Australia received five-year protection visas. Their trauma was compounded. Iraqi survivor Amal Basry, who arrived in Melbourne eight months after the sinking, told me that when she became aware of the kinder treatment being received by those being sent elsewhere, she had pleaded to be allowed to go with them, even though her husband had preceded her to Australia. Basry survived by clinging to a corpse for over 20 hours. When she was rescued, she pleaded that the corpse be taken on board so the young woman could have a dignified burial. The captain pointed out that the limited space on the Indonesian fishing boat would better serve survivors. In a cruel irony, Basry died from cancer in March 2006. By then she had received her permanent visa. 'I am a free woman in a free country,' she proclaimed upon hearing the news. She was able to return to see her two children, grandchildren and ageing father in the Middle East, one more time. When she arrived back in Melbourne, she expressed a wish to be buried in Australian soil. When she died she was accorded a dignified burial. The hearse entered the forecourt mid morning. The coffin was lifted onto the shoulders of the pallbearers, and the crowd followed them into the mosque, chanting. They placed the coffin on the carpeted floor and performed the prayers. Behind the partition wall could be heard the sound of women weeping. A mud lark flew through the open door and swooped over the mourners. It perched on the chandeliers, and darted onto the ceiling fans. 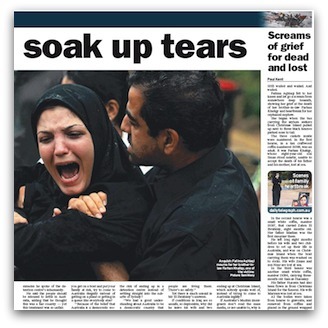 The coffin was driven to the Islamic section of the Fawkner cemetery. The children ran about in the sun, the women squatted by the coffin, Koran in hand, chanting, while the men crowded around the grave to tend to the burial. Basry's body, clothed in a white shroud, was lowered into the grave to her son, Amjed, who had climbed down to receive it. He arranged his mother's body in accordance with ritual, cheek resting on the earth, head facing Mecca. The men standing at the lip of the grave mixed earth and water, and lowered the mixture to Amjed to fix the body in the correct position. Amal was buried to the chatter of birds and children, the murmur of prayers and conversation, in the intimacy of a village setting. This was how she wished it. And this is how it should have been last Tuesday. After the funeral, the detainees who attended should have been allowed to stay on and receive their permanent visas. This simple, common sense gesture would have been a true expression of support and compassion for what had occurred off the shores of Christmas Island, and given the distraught survivors a chance to begin rebuilding their lives. Pressure should be brought to bear on the government to hasten their release. It is the very least that we can do to ease their unbearable grief. Arnold Zable is a Melbourne writer who has documented the tales of refugees and asylum seekers for the past three decades. Thanks Arnold. Our government's abuse of refugees cannot possibly represent the will of the Australian people. Surely we are not knowingly so cruel. Together in numbers we must make people aware of how backward our policies are so that we can halt the barbarism now. What a timely and compassionate piece of writing. It made me weep. And then, it made me wonder why our successive Federal governments seem to have done nothing to deepen Australians' understanding of what the terms "asylum" and "refugees" actually mean.When our parliamentarians themselves seem ignorant of the realities of poverty and political oppression for many of our fellow human beings what hope is there for our enlightenment as a compassionate nation? We need a wider forum for writers such as Arnold Zable.Keep up the good work Eureka Street. Arnold Zable's moving account of Amal Basry's short and tragic life is a testament that we, as a people and as a nation, have not truly joined the civilised community of humanitarians. For this I am truly ashamed. Disturbingly, the latest survey on "racial attitudes and experiences" (AGE 23/02/11) does not bode well for us as a multicultural and tolerant nation. All the things we're brought up to believe, mate-ship and fair-go and all that Christian charity are less than skin deep. No doubt, there will be those who'd say that by comparison to countries like China, Japan, Malaysia et al our policy on refugees/immigration isn't bad at all. So, what are we being compared with? Perhaps to Sweden that has one of the most active Neo-Nazi organisations in Europe? - the list goes on. Or should we lead the rest of this intolerant world in matters humanitarian? I for one will never, ever forget the people from SIEVX and many others we have tortured over the years. Bowen was reprehesible and now we hear that we have DIC's squandering hundreds of millions per year keeping 900 accepted refugees locked up. Our media and pollies are in a wilfully ignorant dance because at bottom they are largely white, lazy clowns. I'm not a religious person, so I probably wouldn't normally read this publication. However the advocacy for human rights is so clear, apparent, and compelling that you are now a must read. I for one echo the compassionate sentiments expressed by the article. Women in Sydney also held a public ritual memorialising the dead of the SIEV X in early November 2001. This went largely unnoticed by the media though they were invited to document the event. As Azmi Bishara so poignantly puts, there is an 'inequitable distribution of sorrow' when it comes to certain people. Even in death asylum seekers open a faultline in Australian culture and society. The two Sydney funerals for the asylum seekers who died trying to reach Christmas Island raise larger questions that deserve comment.